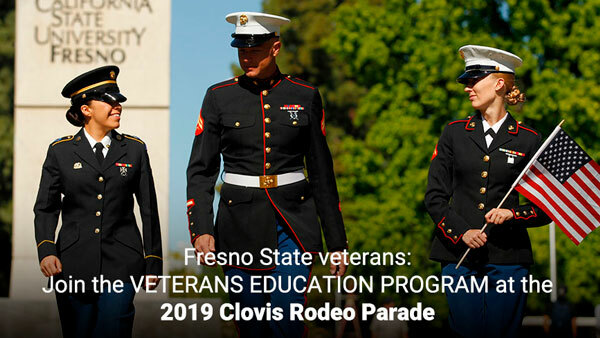 Please join the Fresno State Veterans Education Program in supporting the 2019 Clovis Rodeo Parade (2.5 mile walk). Are you a Fresno State veteran or a family member of a Fresno State veteran? Join Fresno State and other veterans as we participate for the first time ever in the Clovis Rodeo Parade! The first 250 registered participants will receive an exclusive Fresno State Bulldog handheld flag! A portion of the proceeds from the 2019 Clovis Rodeo benefit the Fresno State Veterans Education Program. For more information, contact Katie Bewarder at katieadamo@csufresno.edu or 559.278.5768.